Do You Love Shopping Sales? Jump up and stomp your feet because Stampin' Up! has launched a new Clearance Rack section of their on-line shopping store. All items are retired or discontinued and priced for awesome savings!! Click here to view & SHOP the Clearance Rack. 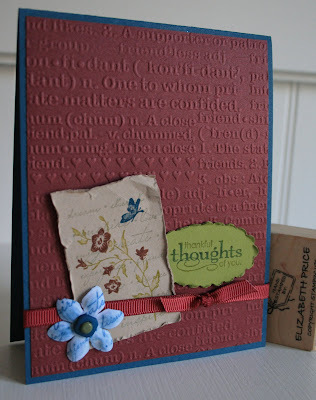 Another card made using the Charmed stamp set. 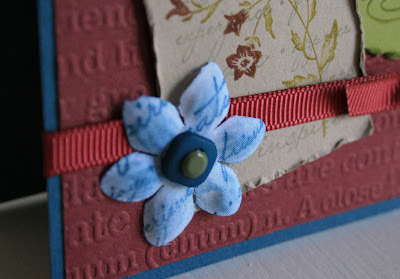 The flower is from the Pretties kit. I used a sponge dauber to add a light coloring of Not Quite Navy classic ink. Then I stamp the text image from the stamp set to add interest and dimension. I had a bunch of leftovers in my scrap box from a class, and I had a swap to make. 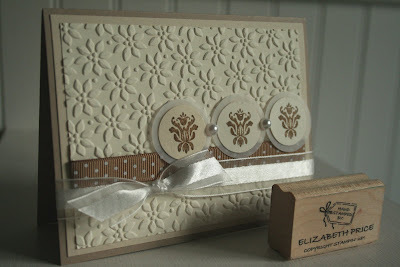 I had just enough pieces to make seven of these Charming cards. 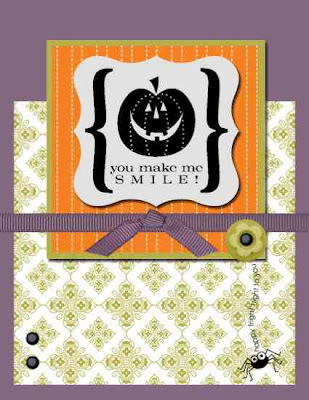 Charming a new stamp set found in the Holiday Mini Catalog and it is absolutely perfect for collage style stamping. The set was designed to coordinate beautifully with the Simply Adorned jewelry pieces. Check out my very first My Digital Studio card. 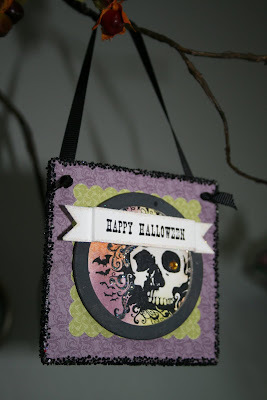 I know what you're thinkin', another Halloween card, but I did it a couple weeks ago. 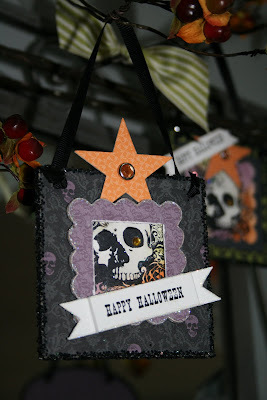 I have moved on to making holiday projects other than Halloween, I just have not posted them yet. I have been working on a digital scrapbook and hope to send it off to print in the next few days. For this card I made it in a matter of about 10 minutes. What a blast this software program is and it is so much simpler than Photoshop Elements. 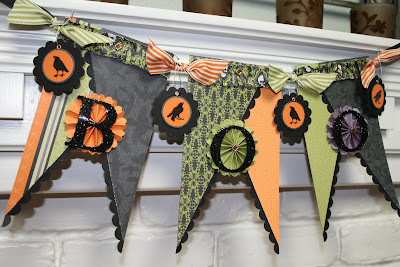 Were making this fabulous banner at my MONSTER MASH MADNESS class. Hopefully you can come. See the sidebar for more details. Interested in a kit, send me an email. In person the focal point on this card is super cool. 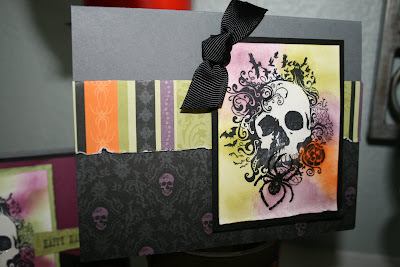 I embossed just the spider which gives the card a creepy look perfect for Halloween. I was mesmerized by the Halloween display room at Convention. These pictures are of a few more ornaments I made which were completely inspired by ones from the Gathering Place. 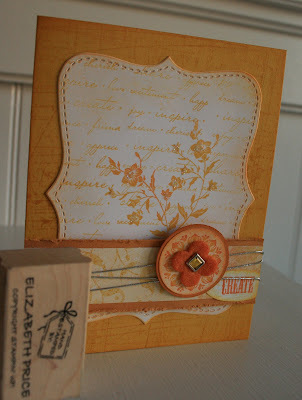 All supplies are from the Stampin' Up! catalog. 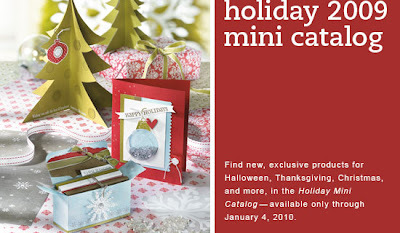 Click here to see the AWESOME, I am telling you it's totally AWESOME, Holiday Mini Catalog.